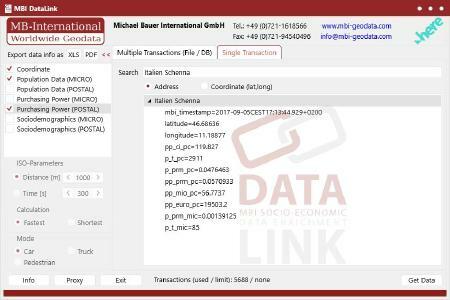 MB-International released the API mbi-data-link.com which enables easy access to a wide range of global MB-International data. The API is a RESTful service with the responses in JSON format. DATALINK is an API for data enrichment, which refers to processes used to enhance, attribute or otherwise improve data by adding coordinates, socio-demographics or economic attributes to customer addresses. DATALINK helps to geolocate customers – visualize relationships between neighboring area, insights on consumer types and consumer spending behavior. With the increasing globalization, understanding the geographic details surrounding an area of where business takes place has become an increasingly critical component in strategic planning. The right data can reduce response times while providing better information for business decisions. When a business looks at the demographic structures of its customers, by paying attention on the people who are currently buying a product or service they gain a clear understanding of who their customers actually are. Once a business acquires this knowledge, they can develop strategies about how to reach each target market and optimize their sales and marketing goals. Companies can identify groups of customers who have similarities like purchasing power, number of households or basic demographics and localize the untapped potentials. With this information companies can optimize their marketing or communication directed at this customer. Users can access the DATALINK API via a third-party application or by using the MB-International DATALINK front-end. Once they have selected an address database (Microsoft Access, Excel or CSV files) and the attributes needed, the database is automatically enriched. The data offer includes globally consistent and comparable datasets ranging from population, gender, age bands, number of households, education, marital status, consumer styles, purchasing power, consumers spending and retail spending on a variety of different geographical levels. DATALINK API can geocode each address or match the postcode in which to find its geographical location. Once the location is known, the API appends the selected data from the chosen associated geographical area to the address. e.g. customer address is in an area with low population number, high percentage of people over 45 years of age, little to no children with an above average purchasing power. To gain access rights to the API, users need credentials in form of an app_id and an app_code which have to be transmitted with every request. These credentials are provided by Michael Bauer International GmbH. 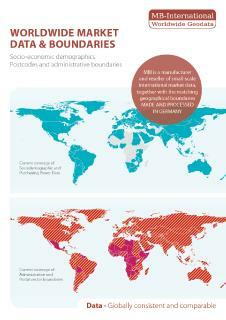 MB-International offers a wide range of data products for business-critical geospatial analysis. MB-International's products include Population, Households, Age Bands, Unemployment, Consumer Styles as well as Purchasing Power, Retail Turnover and Consumer Spending on most geographical levels. They also produce and license vector postcode boundaries (ZIP), administrative boundaries and small areas maps for most countries Worldwide. 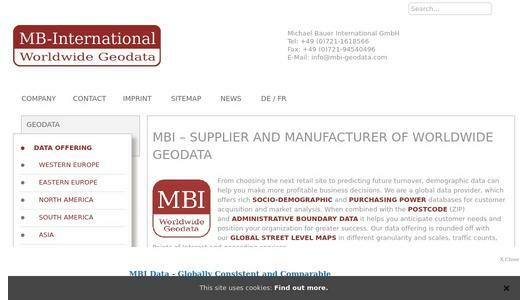 MB-International is a manufacturer and reseller of their own map, socio-demographics and boundary data that strives to provide businesses who want to make better informed investment with market data. MB-International is committed to supporting their customers to achieve an effective set-up and continuous handling of their geodata. Specialized in providing tailor-made data products according to each customer's individual requirements. MB-International's data is used globally by GIS engineers, Marketing executives, OEMs and controllers' for sales targeting, expansion planning and site location analysis in a wide range of Geomarketing and Business Intelligence applications.